A girl is jumping with joy, with an umbrella held high in her hand, as if that umbrella is a knight in shining armor and has the ability to dissipate all her problems. Be it the cruel sunshine or the harsh rains, she can overcome it all. She seemed to be daring the Sun to scorch her with all his might, as she is confident of coming out unscathed, unharmed, mesmerizing me with her courage, infecting me with her zeal. 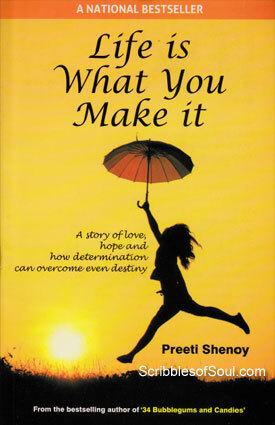 Yes, one look at the front cover of Preeti Shenoy’s novel ‘Life is What You Make It’ and I fell madly in love with her, she made me poetic and I bought the book on an impulse. In fact, it was only after I had received my copy that I cared to look at the blurb, and discovered that the novel is indeed about a girl, who fights with her twisted destiny and comes out on top. ‘Life is What You Make It’ begins with an engaging prologue, with Ankita sitting in a steel chair in a Mental Asylum, waiting for her turn to meet the Doctor, renowned for removing all mental disorders. I had an eerie feeling that the Prologue is much similar to that of ‘Two States‘ by Chetan Bhagat, but the tone appeared more macabre, and I braced myself for a serious story, instead of Chetan’s light hearted comic take on love and marriage. However, as the story progressed, the serious tone set by the prologue evaporated, and instead of a mentally disturbed Ankita, the author introduced a bubbly, confident young student of St Agnes College, Cochin, who believes in living life leisurely, enjoying the attention of a long distance boyfriend and continuous appreciation of her fellow college mates. The story revolved around her mushy romances, zealous extra-curricular activities and her single minded ambitious approach to do MBA from a reputed Institute in Bombay. Everything appears to be going Ankita’s way, with boys swooning over her and girls dying to be friends with her. She was presented as a star performer and nothing seemed wrong with her life. I had a feeling that perhaps I made too much sense out of an appealing front page and ‘Life is What You Make It’ is simply yet another novel about a middle class, ambitious girl sacrificing love for money, who fails to meet her own expectations and ends up at a clinic for some quick counselling. But, Preeti Shenoy proved me totally wrong. After about 100 pages or so, I got the biggest shock of my life. Suddenly, the plot shifted gears and a routine love versus career story was transformed into a heart wrenching first hand account of a schizophrenic. Almost overnight, Ankita is transformed from a brilliant, vivacious girl into a dim witted, scared creature, who is unable to decipher a single written word. She loses her memory, her mind goes blank and she steadily slips into the dark dungeons of depression, even turning suicidal. The real import of Ankita’s woes left me shell shocked. I was mesmerized by Preeti Shenoy’s touching narrative and her realistic portrayal of Ankita’s delusions and her faltering mental capabilities. It was as if Preeti could herself feel Ankita’s pain, though she does not explain the real reason for a sudden change in Ankita’s personality, and I think this probably gave ‘Life is What You Make It’ a more life-like approach. Most of the movies and books about split personality tend to delve into the psyche of the patient and end up as just another medical documentary. But, in this novel, Preeti Shenoy lets the reader decipher his own reasons. She simply presents the story of Ankita in an objective manner. And yet, she does it so brilliantly that I could almost visualize Ankita’s vulnerability and fervently prayed for her fast recovery. Needless to say, ‘Life is What You Make it’ impressed me with its unusual storyline and its real life approach towards the stigma attached with mental disorders in the most unobtrusive way. Kudos to Preeti Shenoy for carving an engaging tragedy! Though, I feel that the initial few pages do not gel with the perfect tragic setting of the later half. But, as a novel about hope and determination, paving way for a great future, it is immensely readable and thought provoking.